Over the past few years we’ve seen more and more hackathons being organised as these events become increasingly popular. Although the reference to hacking might sound negative, they’re a great way of connecting the developer community by learning, working and experimenting with some of the leading API’s and SDK’s out there. And developers love them! We’ve organised our fair share of hackathons (or Hack Battles as we like to call them) and thought it would be nice to share a list of five essential things every organizer should keep in mind when hosting theirs. Setting the right atmosphere is crucial, and having an inspiring venue will help a lot. Just take a look at this photo taken at the recent Hack Italy that took place in a refurbished farm in Roncade, Italy. Smart organizers understand that cramming developers into a dark basement is hardly going to stimulate a creative process. Instead try to pick a venue with enough sunlight, space to stretch or take a walk and provide a comfortable working space to hack. The location of your venue is of equal importance. It should allow for people to leave the hackathon and do something else. Whether it’s in an area with cafes and restaurants, or the peaceful surroundings of a forest, or even just an extra space outside of your main room, participants should be able to go out and take in different surroundings to spark new creative processes. If you’re asking developers and designers to spend over 24 hours at a hackathon you should make sure that food and drink are properly taken care of. You might think pizza, hot dogs, fries and greasy food should keep everyone satisfied, but in our experience most hackers prefer to have a selection of healthy food choices such as salads, fresh fruit, rice or pasta. Paying attention to providing alternatives to the common selection of soft and energy drinks will be appreciated by your attendees. After all, even hackers are only human and they need energy to focus on their hacks. Hackathons are competitions of sorts, so it would seem odd not to have any rules. In essence though, hacking means searching for the limitations of any given system (an API, yourself, hardware, you name it) and trying to go beyond that to create a new experience, learn something new, and build something spectacular. If it’s only natural to break (some) rules while hacking, why have any at all? The one possible exception to this would be the following: as an organizer you should make clear that in order to be eligible for prizes a hack must actually have been created at the hackathon. It’s perfectly fine for participants to spend their time hacking on their own work, but it would be unfair to let them use previously created hacks to compete for hackathon prizes as it obviously gives them an edge over participants that start from scratch. There’s no way around it, after 24 hours of non-stop hacking it feels awesome to win a prize, even if it’s just a small one. That’s why we always ask participating API partners to offer a small prize to those who have hacked on their API. Participants appreciate it and walk away with a smile on their face, not just for having participated, but for knowing that their efforts have been noticed and appreciated. It’s important to note that prizes should never be used as an incentive to get attendees to participate in your hackathon. Hacking with sole intent to win a prize is detrimental not only to the learning experience, but also the fun participants have at the event. Ultimately hackathons are about fun, most importantly the fun that your participants have (despite claims to the contrary). Be open to participants’ questions and remarks, and give them something to laugh about. 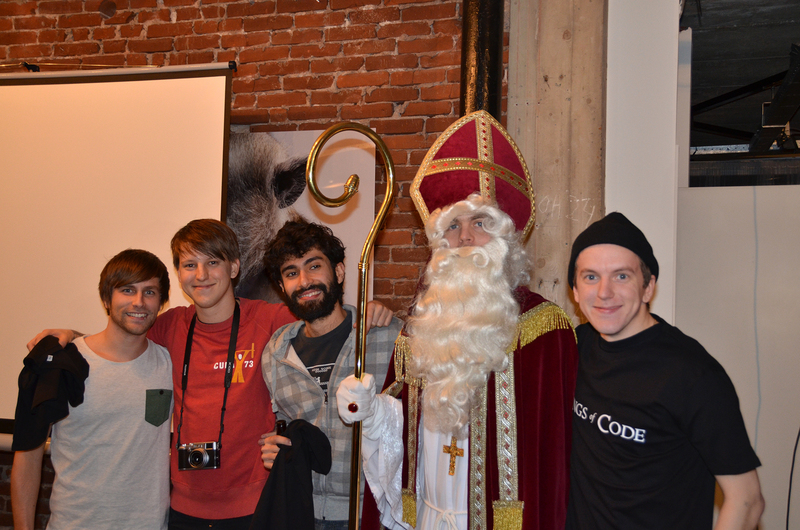 At our latest Kings of Code Festival we surprised the hackers with a visit from Sinterklaas. The best part about any hackathon is the presentations afterwards. It rewards the participants’ efforts during the event and lets them showcase their ideas. Just be sure to give everyone a good amount of time to present, oftentimes they’re nervous and take at least 30 seconds to get into their stories, so giving them at least two to three minutes to present allows them to explain the hack, the technology used and give a short demo. And there you have it, five six tips to help you organise a successful hackathon that we’ve picked up during our years of organising events. What’s the best experience you’ve had at a hackathon? Want to experience one our hackathons first-hand? Join us for the inaugural Hack Battle at TNW Conference USA. Sign up now (it’s free)!